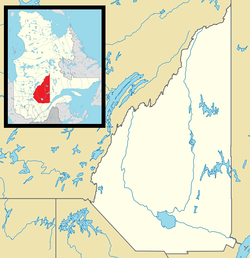 Alma (2011 Town population: 30,904; CA Population 33,018; UA Population 26,016) is a town in the Canadian province of Quebec. Alma is located on the southeast coast of Lac Saint-Jean where it flows into the Saguenay River, in the Saguenay–Lac-Saint-Jean region of Quebec, Canada, approximately 175 km north of Quebec City. Alma is the seat of Lac-Saint-Jean-Est Regional County Municipality. Alma is the second city in population in the Saguenay-Lac-Saint-Jean region after the city of Saguenay. Alma is the seat of the judicial district of Alma. The present town of Alma was formed in 1962 from the merging of four villages: Isle-Maligne, Naudville, Riverbend and St-Joseph d'Alma. The oldest of the villages, St-Joseph-d'Alma, was founded in 1867 by Damase Boulanger. The area became an important industrial centre during the 1920s and 1930s with the construction of a hydro-electrical power station on the Grande-Décharge River, a paper mill (Price) and an aluminum smelting plant (Alcan), all of which are still in activity today. In 2002, Alma merged with the Municipality of Delisle. Alma is serviced by the Alma Airport, located 4.1 km to the south of the town. ^ a b "Alma census profile". 2011 Census data. Statistics Canada. Retrieved 2012-05-24. ^ a b "Alma (Population centre) community profile". 2011 Census data. Statistics Canada. Retrieved 2012-05-24. ^ a b "Alma (Census agglomeration) community profile". 2011 Census data. Statistics Canada. Retrieved 2012-05-24. The census agglomeration consists of Alma and Saint-Nazaire. In the 2006 census, the census agglomeration had also included Saint-Henri-de-Taillon. ^ "Alma community profile". 2006 Census data. Statistics Canada. Retrieved 2010-11-10.